Mozilla, makers of the Firefox browser, has its eyes on mobile. Firefox for Android has been around for some time, and a newer, faster version is set to launch soon. 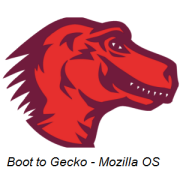 Mozilla has been working hard on a project codenamed Boot to Gecko, which is now referred to as the Open Web Devices platform (though I prefer the codename). I got a chance to test drive Boot to Gecko here at Mobile World Congress, where Mozilla just announced its first carrier and device partner, Telefonica, which is based in Spain. Boot to Gecko is a completely Web-based platform written in HTML5, but you’d never be able to tell. Basically, the whole thing is just one big browser, with web apps functioning like native phone apps. It behaves just like a standard phone operating system. There’s a phone dialer app, a camera app, a gallery app, a browser (within a browser! ), and everything else you’d find on your standard smartphone. Palm’s webOS was a similar concept, but Boot to Gecko is much more open. Essentially, the project is a set of standards for Web-based phones under Mozilla’s direction. Of course, the platform doesn’t yet offer everything a native mobile operating system can do. For one, there’s no Bluetooth support and there’s no Near Field Communication, but Mozilla says it is working on those APIs. When I demoed the platform at Mozilla’s booth at Mobile World Congress, it was running on a gutted Samsung Galaxy S II with Mozilla’s own simple user interface, Gaia. There’s nothing fancy or flashy about it, but it worked well. Games like Cut the Rope functioned as smoothly as they do on the iPhone or Galaxy Nexus. But what about games and other third-party apps? Mozilla has you covered. There are already a slew of HTML5-based Web apps available, and Mozilla plans to help you find the best ones with its own app store. The Mozilla Marketplace will have curated content with reviews and information from the Mozilla staff on the best apps and games. Because the platform is completely Web-based, it doesn’t have strict hardware restrictions. This means that carriers or manufacturers can run the operating system on inexpensive phones. Telefonica and Mozilla are planning to release a series of lower-end phones based on the platform. The platform is also open-standards-based, which means that carriers or manufacturers can customize it however they want. In fact, the Boot to Gecko on Telefonica’s demo device looks completely different from the Gaia interface I saw at Mozilla’s booth. It seems a bit ambitious for Mozilla to enter the mobile operating system wars when Android and iOS are so well established as the top players in the game. And with Windows Phone growing and Windows 8 on its way, Mozilla seems downright crazy. But Mozilla isn’t trying to compete with the giants. Boot to Gecko isn’t a new OS; it is a new way to bring Web-based phones to market.